“Breakfast” was a candidate for today’s word but then I realized the word needed to be “dates” because we were on one. We’ve been married nearly 7 years and firmly believe in going on dates often. Today I’m sharing some of our tips for the perfect bicycle date. That means a ride that either of you would do on your own. If you’re at dramatically different levels of bike skill and physical condition, bear in mind that this is not a ride with one of you in the role of coach. That’s not a date, it’s a recipe for disaster. If one of you is very experienced in riding in a busy urban setting and the other sticks to separated trails or empty country roads, riding through the downtown core in lots of traffic will make for stress. By definition, not fun. On a related note, one of the issues some couples face is a differential in how far or fast each wants to ride. Thus bike dates are a good test of the art of compromise. Since I’m built for comfort and my husband is built for speed, we don’t go for bike dates when he’s in need of a training ride. I joke that he could be in Zone -2 and I’d be in Zone 6 on a standard range of 1-5. No, at our house a date ride is always a recovery ride. Note to people who train with great dedication and enormous amounts of record-keeping: Do not consider a bike date a training ride. You’re not supposed to drop your date. The “somewhere to go” could be “let’s noodle around that neighborhood and stop at all the art galleries” so this doesn’t mean you have to map it all in latitude and longitude. The idea is to put some bookends on it so that if one of you is (ahem) less conditioned than the other you can each prepare mentally and pace yourself according to shared expectations. Had my husband said “Let’s ride north until we find a breakfast place” I wouldn’t know how far I might have to go before caffeine and calories. This “until X” means of choosing a destination might be an awesome approach for you, in which case your “somewhere to go” is “until this criterion is satisfied and we agree in advance on how we’ll know.” For some couples this could be a recipe for an argument as Rider 1 looks longingly at the windows of bakeries while Rider 2 thinks better pastries lie far ahead in some other ZIP code. The point here is to agree in advance on the constraints. 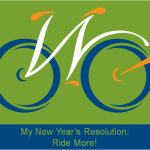 Don’t ruin a bike ride with squabbles and whining on the way out–you still have a return ride ahead. We picked a breakfast place about a 45-minute ride away in Bothell and saddled up. We’re both experienced at riding in traffic and controlling the lane as needed for safety so for us this isn’t about staying off busy streets. This might be a concern for you and you’d want to do some route planning. No, for us it’s more about how many climbs I can do since I’m married to someone who does hill repeats for fun. 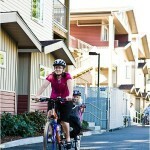 The Burke-Gilman Trail provides a smooth, traffic-free connection for us north and south, not too far from where we currently live. Inevitably we climbed up to get to it, and up to get away from it. On our return we hit only one hill that involved me pushing for a few yards while he did hill repeats to wait for me. This is a sign I’m getting stronger, and the walking was mostly a function of riding a really steep uphill (most of which I did actually ride up) on a full stomach, honest. This tip comes to you courtesy of my friend Betsy, who discovered after miles of hard pedaling on her first date with her future husband-to-be that her back brake had been rubbing the entire way. One of you may have to work a lot harder than the other to keep up, but try to avoid adding an actual handicap like a rubbing brake or squishy tires. What’s your plan if something goes wrong along the way? Whether you pull out toolkit or cell phone this represents a test of the relationship on various fronts, from possible assumptions about gender roles and mechanical aptitude to how someone copes with the stress of the unexpected. On this particular ride we talked about the book we both just finished reading, The Bar Mitzvah and the Beast , about a cross-country ride by a family of four (funny, thoughtful, and inspiring–we both recommend it), and compared our preferences concerning the various architectural styles along the way. Doing so on a bike ride has a much lower stress threshold than doing so with a Realtor in tow and dueling comfort levels with mortgage size. This period may extend for some time if it’s a first date and you have the sudden realization that you could never, ever have a second one. On the other hand, if it’s a first date and you can talk and laugh forever, not even noticing the miles under your wheels, this is a very, very good sign. For the record my husband and I have very similar taste in houses. What stuff? In our case, half of my breakfast in a takeout box because it was enormous and I couldn’t eat it all. Then later it was my fleece vest as I overheated on that steep hill and stopped to ditch a layer. If you’re poking around neighborhood bookstores together you’ll buy books. Or the pastries at the bakery are so great that you buy a couple of extras, planning to eat them a few miles down the road when you’ve earned them. Bikes offer their own varieties of flexibility as a means of transportation. I’m talking about each of you staying flexible about what happens along the way. Where we ended up for breakfast this morning. 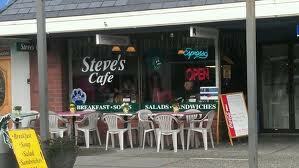 Those of you who know Bothell will also know which cafe was our original destination. We’ll try it on another date. When we got to Bothell the cafe we’d planned to go to had a 25-minute wait. Another place beckoned from across the street and we headed over to check out Steve’s Cafe. A couple just exiting who had biked up with the same plan said it was fine and we settled in for a very satisfying breakfast. Because you’re on the bike you may see things that make you want to stop and appreciate: a beautiful view (today’s ride was full of spring green), public art (we went by the young stand of Blue Trees in Kenmore), or a photo opportunity. For that matter, one of you might spot the perfect bench where you plan to drop to one knee and propose. This is a bike date, not the Tour or a championship competition. You may well go on those types of rides together–both of you sprinting to city-limit signs or jumping stumps or whacking around in bike polo. The date portion might take place before and after the riding event, so I’m not saying don’t do those together if that’s what turns your cranks. I’m just saying that on a really good date–one that makes you smile, one you’ll talk about afterwards saying “Wasn’t that great?”–each of you is there for the purpose of focusing on the other person and enjoying your time together. Few things are better for that than a simple bike ride. What’s your best bike date memory? 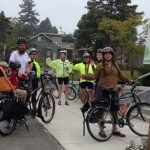 This article was posted in Adventure, Attitudes, Family biking, Humor, News. Bookmark the permalink. Follow comments with the RSS feed for this post. Both comments and trackbacks are closed.